The Otolaryngology Clinic at West Campus Building 3 focuses on treating ear, nose, and throat (ENT) conditions. As part of UT Southwestern Medical Center, we are one of the nation’s leading clinical and research centers for audiology, cochlear implantation, balance and facial nerve disorders, head and neck cancer, sleep disorders, voice care, and related specialties. 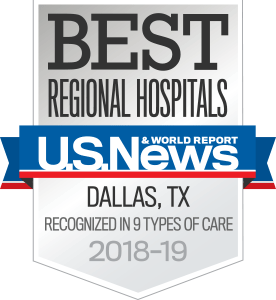 UT Southwestern has an outstanding reputation for research, as evidenced by the numerous peer-reviewed articles published each year by our ENT faculty and residents. Our clinicians work in unison with our researchers to provide patients with the most up-to-date therapeutic techniques available. Our clinic provides expert care and effective treatments for all types of nasal and sinus disorders, including rhinitis, sinusitis, congestion, nasal polyps, and nasal tumors. We also see patients who have infections, deafness, or dizziness, and people who need ear reconstruction. Our experienced team of specialists offers advanced diagnostic procedures and both medical and surgical treatments, including innovative medications, speech and language pathology, groundbreaking therapies, and both minimally invasive and traditional surgical procedures. We also provide hearing tests and hearing aids. UT Southwestern’s Voice Center, which is located at the Otolaryngology Clinic, provides state-of-the-art voice care for patients with voice disorders and other conditions affecting the larynx, swallow function, and airway. On the day of the appointment, please arrive 20 minutes early to allow time for parking and registration. We do our best to see patients at their scheduled appointment time. For a seamless patient experience,the building has a patient service center that can draw blood for all orders that might be ordered at the appointment. If it’s necessary to cancel an appointment, please call the clinic 24 to 48 hours in advance so we can accommodate others.